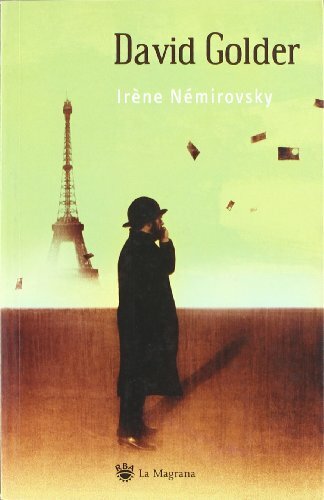 When I see a book by Irene Nemirovsky that I haven't read, I grab it, as they've not all been published in the US yet. (I've posted before about how much I enjoy her work.) So I came across a British edition of David Golder a couple of weeks ago in my favorite used bookstore, and snapped it up. Set in Biarritz and Paris in 1929, this is Golder's story. A wealthy elderly Jewish businessman, David Golder has a wife and daughter who live for pleasure and luxury. Their interactions with him consist solely of requests for money or complaints about not being able to afford a new diamond necklace or a new car. His wife does this shrewishly, his daughter coquettishly. He hates his wife and adores his daughter, even as he understands that she does not love him. He gives them everything they demand, every time. This has been his family life until two crises occur, almost at the same time. The stock market crashes, bankrupting Golder, and he has a heart attack. At this point in the story, I was expecting the focus to shift to the wife and daughter, perhaps exploring how they would cope when their expensive lifestyle went away, and how their relationship with Golder might evolve. But it isn't that kind of story. The focus and point of view remain Golder's. The wife and daughter remain pretty much the same people, casting about for other men to support them. Now I began to be fascinated with Golder's character--how would he change, what direction would he take, as a result of the upheaval of his life? We start to get some backround; his early life, his marriage. With these details came, for me, a tenderness toward this character, who was portrayed initially as not a particularly nice man. The choice he ultimately makes about what to do with the remaining months of his life is movingly told, and the book here becomes quite a page-turner. As he drags himself through his last weeks, will his heart hold out long enough to see his plans through, and is this really what he wants to do? This is not an author I know but the book sound fascinating. New Follower. Welome! Yes, she's not that easy to find, but Suite Francaise and Fire in the Blood are usually in the library/bookstores. This author's books are easily found, here in the UK, although having said that, she is not an author that I have ever read, but that is only for the reason that there are just too many great books and authors out there and never enough time to read them all! This does sound like a great book though, Golder's wife and daughter sound positively awful, although you did say that at first Golder himself was not portrayed as a nice man either. Sounds like they are a well matched family! I love books which have good characterisations and delve into the human psyche a bit, so thanks for the recommendation on this one, I shall be sure to follow up on it. Definitely not a nice family! Golder had my sympathy by the end, though.